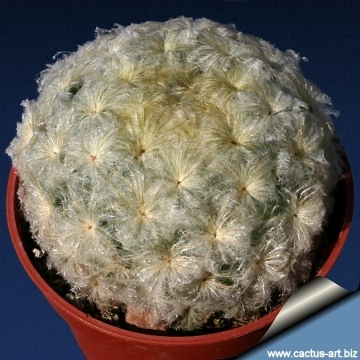 has beautiful feathery looking spines that are so soft, it makes it one of the friendliest of all cacti. 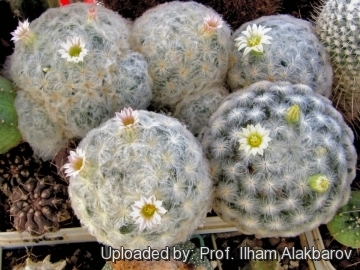 Altitude Range: Mammillaria plumosa grows at elevations of 730 to 1,350 metres above sea level. Habitat and Ecology: It grows on limestone cliffs in sparse xerophytic shrubland, there is continuing decline due to ongoing collection, but the number of locations probably exceeds ten and the population is not likely to be severely fragmented. The species is illegally collected for the ornamental trade. The local community in the area also collects plants from the wild and sells them at local markets at Christmas time, as they are used to decorate nativity scenes. 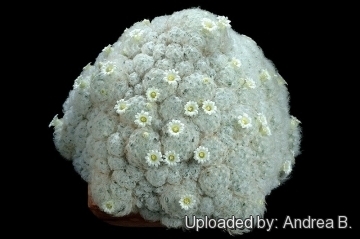 Mammillaria plumosa var. roseiflora n.n. 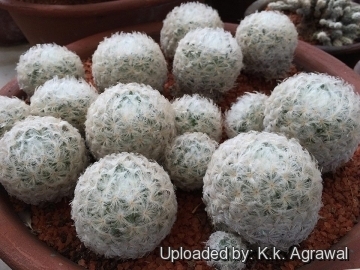 Description: Mammillaria plumosa is a clumping plants that forms low, dense mounds sometime up to 40 cm wide entirely covered by the mass of white feathery spines. Stems: Depressed globose or somewhat elongate, without latex, spherical, 4- 7 cm high and in diameter. Light green, but appearing white because of the dense spines. Tubercles: Small, flattened, 2-4 mm long, somewhat woolly in their axil. Radial spines: About 40 per areole 1 - 7 mm long, white, weak, interlacing, feathery. 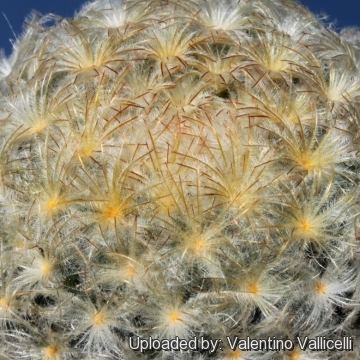 The spines in this specie have very long hairs along the spine-axis arranged as are the segments of a bird's feather and that furnish an epidermal protection against the blasting sun of the desert. Flowers: Whitish yellow, up to 3-15 mm long (occasionally with pink midstrips), with a strong sweet scent. Perianth segment with a reddish line running down to the centre. 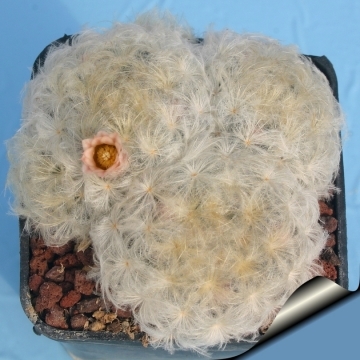 Mammillaria plumosa F.A.C.Weber in Bois: is entirely covered by the mass of white feathery spines. Flowers whitish yellow. Distribution: Coahuila and Nuevo León. Mexico. 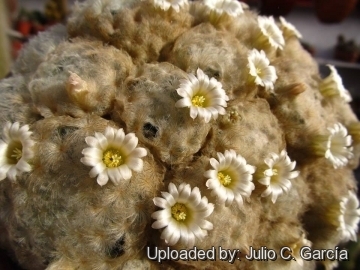 Mammillaria plumosa var. roseiflora n.n. : pink flowers instead of yellowish white. Garden origin. 5) Fitz Maurice, B, Sotomayor, M., Fitz Maurice, W.A., Hernández, H.M. & Smith, M. 2013. 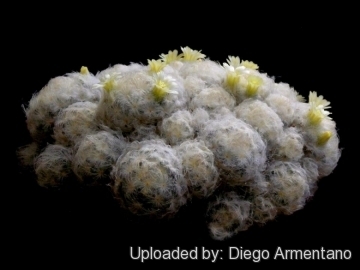 Mammillaria plumosa. The "IUCN Red List of Threatened Species." Version 2014.1. <www.iucnredlist.org>. Downloaded on 21 July 2014. 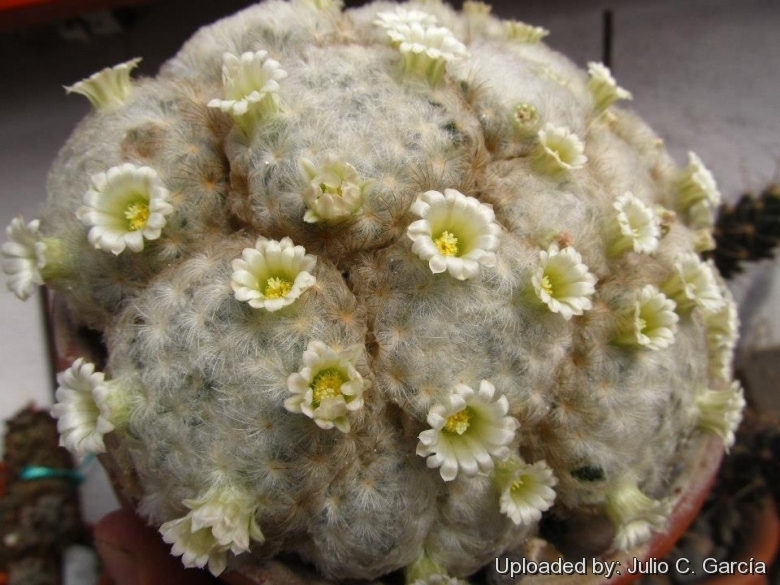 Chilita plumosa (Mammillaria plumosa) Photo by: Andrea B.
Cultivation and Propagation: Needs regular water in summer, but for best appearance keep water off of the spines. Do not let the soil become too dry in winter, either. It does better with a good drained soil mix since it is a rot prone species, whose roots are easily lost in pots that stay damp for any length of time. It takes a couple of years to offset, but once it starts it can fill a 25cm pot in just a few years. Needs full sun or light shade in summer. Propagation: Seeds, offsets (Cuttings root quickly).